If I could give "The Coming" fifty stars, it would not be enough. I have waited in high anticipation for this book. Daniel Black had given hints as to what The Coming was going to be about; The journey forced upon the Africans who were kidnapped, razed and locked into the holds of large ships heading to America. 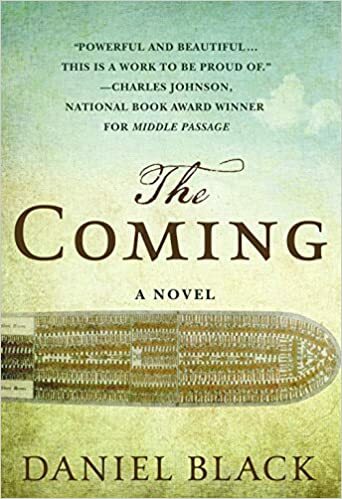 I never include spoilers in my reviews, but let me say, that I found it important to read "The Coming" out loud, like I did the previous four of Dr. Daniel O Black's books. I am getting goose-bumps right now, but I felt it was vital to carefully name aloud each tribe mentioned, every name that came across the page, was spoken out in honor and memorial...Yes, this is fiction, but we know how truth is so much stranger, and harder to swallow than truth dished cold. I am a serious fan of Dr. Daniel Black. I met him at our Arla (Arkansas Library Association) conference in 2014. He was a nominee of The Arkansas State Library's, "If Everyone in Arkansas Read the Same Book" award. for "Perfect Peace." During the conference, Daniel read a chapter from Perfect Peace. Written with precision and perfect grammar the setting and characters were Deep Southern genre, but more...Much more. His books are stand-alone, but I wanted it all. During Thanksgiving 2014, I read all four of the fictional novels that follow a genealogical and historical timeline from Africa to Conway County, Arkansas. Starting with "They Tell Me of a Home" I followed Tommy Lee Tyson back home to Swamp Creek, Arkansas. Based on Blackwell, Arkansas, it is just down the road about 20 miles. The first day, it was my grown kids, one grandson, and two grand-dogs who sat and listened while I read out loud about dusty farm roads, and regal Peoples who have refused to succumb to the genocide wished upon them at the end of slavery. I laughed, cried, and sometimes had to stop, and get control of my emotions. Halfway through, everyone left for the holiday - it was me and the dogs. I continued to read aloud the beautiful and tragic pieces and bits of the lives of mighty peoples who have had to bide there time, awaiting their reward for being true and loving their Creator. "The Sacred Place" was next, following the timeline of Tommy Lee Tyson's family, community and history. I read to me, and I read to the dogs. I weeped, I laughed, I was astonished. When I would stop reading, the dogs who appeared asleep, would growl slightly letting me know they wanted me to read on. I did. Next, was "Perfect Peace." Right now, I am starting to tear up, because words fail me. I am not black. Most of my life I have been poor, and lived among People of Color. Although I was poor, and lacked privilege, my whiteness gave me opportunities, and kept me from arrests and jail. I have always fought for human, civil and environmental rights. After re-locating from Southern California to Arkansas, I learned that The Civil rights movement was incomplete. Men and women were still using separate facilities, and being hung on trees out in the woods...simply for being a beautiful dark color. I will never "know" what my brothers and sister of color feel, but I am empathetic. I have always prayed for healing, and it has taken me over fifty years to understand that healing begins with acknowledgement. There is no going back. It is impossible to undo the murder, degradation, kidnapping, rapes, slavery, etc., but it can be spoken about. The stories can be told. Once there is an agreement that horrible things were visited on People of Color by greedy white men and women, then healing can start. Stories can be completed, healed voices can heal more souls. Humanity can find what it has lost in a grab for wealth and power. I finished my Thanksgiving week, with "Twelve Gates to the City." I will never be the same again. I did not purchase the first four books, I checked them out from our library. I have read many of the reviews done on the prior four books before "The Coming," and I was dismayed that so many thought Dr. Daniel Black was being preachy. It is unfortunate that they missed the story, the healing and the divinity of a Black Teacher who is sent to bring History, Roots and Healing.